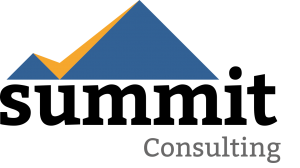 Summit Consulting leverages extensive transformative project management experience and a passion for results to provide our clients with the tools to manage and execute complex, cross-functional projects. Strategic project management is more than developing and maintaining detailed project plans. We partner with all levels of your organization, helping your team to plan and execute complex projects from start to finish. Our skilled project managers bring years of consulting experience that enable us to partner with you to develop strong cross-functional project teams, proactively identify and mitigate risks, and keep projects on schedule and on budget. With the project goals and intended business results fully in mind, we design and implement a plan that ensures those results are realized. We build a comprehensive project strategy that engages team members at the right levels of the organization to advise, support, and execute against project goals. Through the development of detailed project management plans, including the tools and governance processes to get you there, you will meet and exceed the goals of your project. Our team also has extensive Change Management experience to support the people side of change. Complex projects may impact one or more of the following people, processes, technology, and organization structure; our Change Management services can help you prepare your people to adapt to the changes that result from project implementations. Colleagues need to understand what the end goal is and why it is important to the organization and strategy. Without a clear vision for the future, the team cannot make the decisions that support the project goals and desired business results. Team members, leaders, and project advisors may question whether the company is headed in the right direction or whether they want to commit personally to the effort. Effectively articulating a business case and alignment around the vision are essential components to both the alignment of leaders and engagement of stakeholders. Leaders need to provide a road map and plan to guide decision making to get there. Colleagues within an organization will look to their leaders for direction and support during a project. Leaders themselves be aligned on project goals and the role their team must play to ensure success. Alignment and commitment to the priority and direction of the project and a deep understanding of how the organization’s culture can either accelerate or impede project goals are important factors for a successful project that needs to begin at the top. Project planning should include plans for engaging leaders across an organization and defining expectations and accountability for project goals clearly to leaders, managers, and team members. The most successful projects ensure ownership by leaders willing to accept responsibility for execution in all of the areas they influence or control. Ownership is often best created by involving people in identifying problems and creating solutions. Too often, project leaders underestimate the commitment and time required by key resources to complete their responsibilities to the project. It’s critical to assess whether or not resources need to be dedicated to the project or if their time can be split across multiple efforts. Projects may be composed of both dedicated and part-time resources, generalists and subject matter experts. The key is to determine the role, area of expertise, and commitment required for each resource and establishing plans that account for any gaps due to resource limitations. Projects rarely proceed completely according to plan. You must expect the unexpected. Colleagues react in unexpected ways. An organization faces additional challenges that were not on the horizon at the time of planning. Effectively managing projects requires continuous assessment of the organization and adapting to new challenges. Sometimes adjustments are necessary to maintain momentum in order to achieve the desired results. Regular, predictable meeting schedules enable careful tracking against project goals, opportunities to assess and identify risks, and solve problems. Project leaders should determine the frequency and content of these meetings and identify the required team members to provide updates. 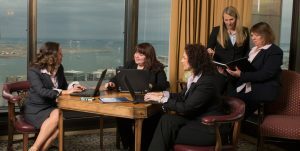 Regular meetings with leadership and advisors should also be planned to report on results, including any risks or issues, reinforce accountability, and ensure there are no surprises.